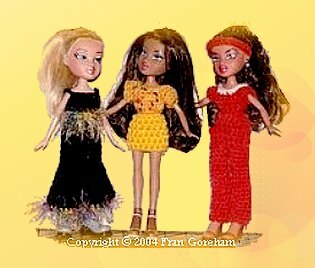 Crochet a wardrobe of clothes for ten inch dolls such as Bratz™ dolls; free patterns to crochet a mini skirt, sleeveless and puffy sleeved top, long skirts, shorts, straight leg and bell-bottomed pants and poncho. Copyright 2004 – Strictly enforced. Do not sell this pattern. Here are some basic instructions using simple crochet stitches and a cache of yarn bits to create a new wardrobe for your Bratz™ dolls. The mini skirt pattern is the basic design for both skirts and pants. The sleeveless top is used for various shirts with different sleeve lengths. For pants or skirts – 2 small (approximately 2″ diameter) rubber bands or thin ponytail holders without metal clasps. A 3″ piece of 1/4″ elastic may be used instead, overlapping the ends 1/4″ and sewing them together. Embellishments such as beads, small buttons, lace, bits of novelty yarns or rickrack. Iron-on “Jazzy Jeans” stars were used on the blue bell-bottom outfit. An embossing heat tool was used to apply the stars to avoid flattening the yarn fibers with an iron. But use caution; this tool is very hot and can scorch the yarn. Varies with different yarns but averages 4 – 5 sc = 1 inch; 4 – 5 rows or rnds = 1 inch. It may be necessary to add a row or two to the length of the garment to allow for the difference in yarn weights. Join rounds with slip stitch in top of beginning ch. Count as 1 stitch. Rnd 6: Repeat rnd 5. Join and end off. Weave in end. Rnd 7-9: 3 Hdc, inc around. Join with sl st in top of beginning. End off. If desired, work 1 round of contrast crochet stitches around bottom. 14 – 15: Sc in each hdc around. End off. Second leg: Attach yarn to dividing stitch (sl st) of legs. Ch 1, sc around (10 sts). Join with sl st in first st. End off or make longer to match first leg. Rnd 21-24: Ch 1, sc in each sc around to desired length. Work as for the bell-bottom pants but delete increases in legs. Row 6: (Neckline) Sc in ea st of back, over inside loop of ch sts for shoulder straps, across the front, over the inside loop of ch sts for the other shoulder strap and across the back. End off. Rnd 6: Attach in any underarm st, with sc, sc in remaining underarm sts, side of armhole, outside loops of shoulder sts, and back side sts. Join in 1st sleeve st.
Rnd 7: Ch 1, sc around. Continue adding rounds for longer sleeves. Repeat for other sleeve. Rnd 8: Dec in each 2 hdc sts. Join. End off. Ch 26. Join in 1st ch. Ch 1, sc in each ch around. Join in 1st st. End off. Ch 11, turn, dc in 2nd ch from hook and in ea st across, 9 sts. Ch 2, turn. Repeat for 8 rows. Make 2. Sew short end of one rectangle against the long side of the other. Sew other two short ends together for the center back. Fringe if desired with 2 pieces of 3″ lengths of yarn hooked into every other stitch.